Please note our Easter closure dates. 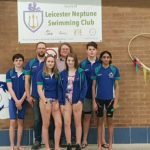 In August of this year six Leicester Neptune swimmers will be swimming from Dover to Calais as a relay in an attempt to swim the English channel and raise as much money as they can for Aspire. Aspire is a charity which raises hundreds of thousands each year for people with life changing spinal injuries. Those taking part are : Umer Hashim, Charlie Goddard, Katie Kirk, Maciej Mosiolek, Kate McCallister and Sam McCallister. This challenge entails a 21 mile swim, overcoming 14-18 degree temperatures (Evington is 28 degrees) as well as potentially choppy waters, not to mention jellyfish. The team has already raised £3,300 for Aspire however if they are to reach the £12,000 target set by the swimmers, any money you’re willing to donate would be greatly appreciated by the team! Please see our Just Giving Page. Please arrive by 14.30hrs, for warm-ups commencing at 15.00hrs. The main Gala will start at 15.30hrs. Please Note : that there will be no training on Friday 8th March 2019 at Parklands. TimeTrials are being held at Evington on Friday 8th March. Junior Parklands swimmers not at the City Openmeet should enter the time trials. The teams for the Diddy League will be selected on the basis of having legal times. Swimmers without times will be unlikely to swim in the league. Senior Parklands swimmers may attend the Evington session at 8.45.